How to backup iPhone without WiFi? Or in other words, is it possible to backup iPhone without iCloud by default? To keep you from losing any iPhone data when your iPhone is under no WiFi condition, we have found 3 ways for you to backup iPhone without WiFi network. DearMob iPhone Manager, a professional iPhone backup software with encryption methods comparable to iTunes, can enable you to 1-click backup iPhone without WiFi and save iPhone photos, music, videos, contacts, messages, bookmarks, etc to computer with no quality loss. Just USB-connect your iPhone to computer and backup everything on iPhone to computer quickly with password protection. Do You Really Need WiFi to Backup iPhone? Optionally, you can get Google Photos app to backup iPhone photos to the cloud over cellular or use Gmail for mail, contacts and calendar without WiFi or iCloud if you have enough data budgets. However, that would leave important things like SMS, call history, bookmarks, etc that could not be backed up if there is no WiFi for iCloud backup. WiFi is a must-have for iCloud to backup gigabytes of iPhone media like photos, videos, music and small size data like contacts, messages, bookmarks, etc, but is there any other solution that could help backup both large files and small size data on iPhone in a money-saving way when there is no WiFi? The answer is yes. How to Backup iPhone without WiFi? No WiFi means that you can't use iCloud backup by default, but your iPhone backup without WiFi will work well when you meet the following methods. DearMob iPhone Manager is a very easy way for you who aren't tech savvy. Featuring user-friendly interface and clear one-stop guide, you can backup iPhone without WiFi in a click and manage iPhone iPad iPod data at once without in advance rehearsals. This iPhone backup software empowers itself with kinds of useful functions besides backup, say music management, making iPhone ringtones, syncing photos, contact transfer, export voice memos and import safari bookmarks, to name a few. 1:1 backup and transferring preserves the full resolution of your iPhone videos and photos as well as saves full information of your iPhone contacts, messages, bookmarks, etc, which makes DearMob iPhone Manager the No.1 choice for you to backup iPhone without WiFi as of now. Step 1. Click the download button below to download DearMob iPhone Manager, install and launch it on your computer. Step 2. Connect your iPhone to computer via USB cable, tap "Trust This Computer" on your iPhone if there is a message popping up and then this iPhone data backup software will automatically detect your device. Step 3. Click "Backup" button to backup iPhone without WiFi. 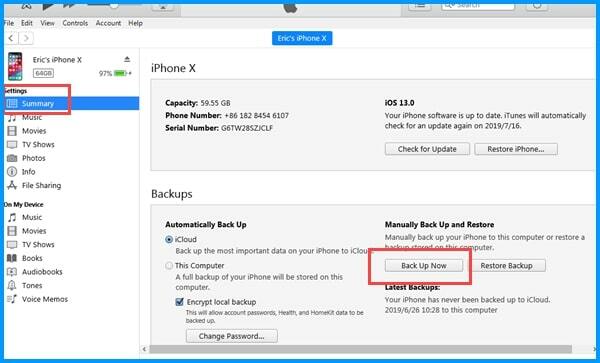 When you access the backup window, just click on the Back Up Now button and DearMob iPhone Manager will automatically backup iPhone without WiFi for you. The time required for backup is based on the size of your iPhone data, so please be patient if you have lots of data. Besides, DearMob iPhone Manager also allows you to encrypt your backup. Notice: After backing up, you are allowed to find details of everything you backed up on computer with DearMob iPhone Manager. And restore backup files to new iPhone XS Max/XS/XR anytime you need. Regardless of iTunes not recognizing iPhone problem and slow backup of iTunes, iTunes, as the native iPhone backup tool from Apple, is the most popular way to backup iPhone iPad and iPod without WiFi indeed. Step 1. Launch iTunes and connect your iPhone to computer via USB cable. Step 2. Once connected, you will see a phone-shaped icon in the menu bar, just click on it. Step 3. Click on Back Up Now to manually backup iPhone without WiFi. Or you can refer to Automatically Back Up option where you could click "This computer" to create a new and locally stored backup immediately each time you connect your iPhone to Mac. 2. iPhone won't backup via iTunes problem happens due to different and unclear reasons. Besides, it is a full backup solution that doesn't allow you to selectively backup iPhone data. 3. You can see whether your iPhone backup succeed or not in iTunes Preferences, but you are not allowed to view the iTunes backup files on computer. 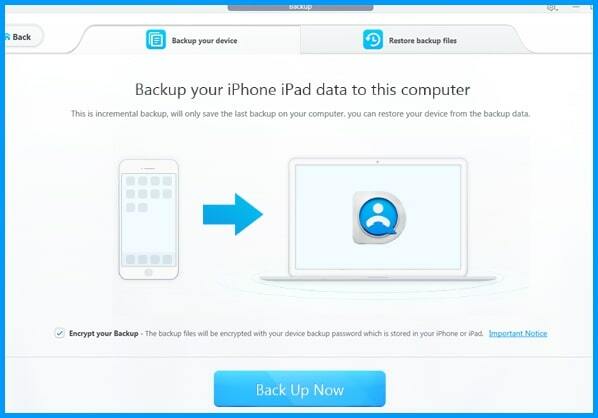 To find iPhone backup on Mac or PC, you need DearMob iPhone Manager. 4. Health and Activity data backup via iTunes could not be completed unless you encrypt your backup, that is, selecting the Encrypt backup box and then create a memorable password. Warning: Backup iPhone via Cellular data is disabled by default as it may bring you high internet bills. So, if you understand the possible financial risk or have an unlimited data plan, you can use cellular data to backup iPhone without WiFi. Notice: If you can't bear the high data chargers, you can simply turn off this feature or refer to DearMob iPhone Manager or iTunes to backup iPhone without WiFi. Using cellular data to backup iPhone actually equals to backup iPhone via iCloud so that you can't find where the backup files are. How to Backup iPhone Data: Videos, Photos, Music and More? How to Solve "Why Won't My iPhone Backup"? How to Backup Multiple iPhones to One Computer?